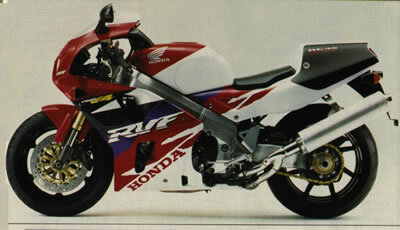 If incoming of Thunderace in 1996 scared bosses of Honda , incoming of R1 in 1998 shocked them completly . YZF-R1 was one of the most classified model in modern history, photo of grey colored prototype bike were made already in summer 1997. Only few months before YZF introducion. Yamaha developing department was forced to make something really radical. Honda knew about new Yamaha many months and it reflected on the new 1998 Fireblade. Fireblade went through much bigger changes than Honda originally planned. First time after introducion in 1992 eppeared on the market serious competitor. Weight of Fireblade decreased on 179 kg rebuild was engine (according Honda 80% of parts), had more comfortable behavior, but increase of HP was minimal - 2 HP on 130 HP. Reaction of engine was better thanks to the new and bigger carburator. Gearbox was slightly adjusted, which caused an increase in the top speed of about 6 km/h. Also engine cooling was improved, frame was lightened ( about 4 kg ) and also was improved stability by lowering of fork offset. The fork was changed, new bail arm had higher torsion stiffness and diameter of front rotor was increased from 296 to 310 mm. Also were used new four piston brakes. Look was changed thanks to a new headlight and remodeled hood. In comparison with previous model Honda improved model at least 10 %, but it wasnt enough. The world was captured by R1 fever. Blade riders fast forgot on RR when they saw the new R1. Yamaha engaged by modern look and although it was only 2 kg lighter then Fireblade looked liket would be lighter at least 50%. In streight competition R1 wasn't clear winner. Wasn't so stable, didn't turn so easily and in lower speed falling into the curves too much, but it didn't avoid RR from second position.